The Rainbow Trail/Desert Crucible is considered a sequel to Riders of the Purple Sage. One of the main differences between the The Rainbow Trail and The Desert Crucible lies in the changing laws of the times. At that point polygamy was outlawed by the US Government. Therefore, the fact that Fay Larkin was forced into a sealed marriage as a plural wife to a Mormon man was downplayed in The Rainbow Trail. Zane Grey was vehement in his criticism of the Mormons who kidnapped gentile girls, then forced them into marriage and basically raped them. I agree completely with him and his criticism. What he shows us is the way it was for a great deal of polygamist women of the time (The 19th Wife). Shepperd gets a job delivering goods to a village of about 50 women, all said to be sealed wives of mormon men. Due to the outlawing of the practice of polygamy the Mormon men felt the need to hide the reality of their marriages. Finding out about this village could turn out to be a dangerous thing for Shepperd. As it turns out later in The Rainbow Trail the Mormon leaders were correct in worrying about the safety of their secret villages. With the law in hand, the US authorities set out to put an end to what they saw as an evil practice. In fact some of the younger generations of Mormons were also beginning to see the practice of polygamy as evil. Through the character of Mary we are shown what happens when the Stockholm Syndrome begins to hit. This is a period of time in Mormon history that Mormons have an obligation to be ashamed of. As a formed Mormon myself, I do indeed feel some of that shame and even greater shame in later attempts of hiding what was done to these young girls. When it comes to the treatment of Native Americans the Mormons were like any other missionary belief. They wanted to convince the Native Americans that what they believed was wrong and that the Mormon belief was correct. The discrimination was the same. The settlers accepted indian aid when that was needed and persecuted the Native Americans when the Mormons wanted what the Native Americans had – including their women and children. So, no difference. Originally published in 1915, The Rainbow Trail is the sequel to Riders of the Purple Sage (also a Bison Book). At the end of that famous novel, a huge boulder had rolled down to shut off the entrance to Surprise Valley, leaving Lassiter, Jane Withersteen, and little Fay Larkin to a singular fate. Twenty years later a lanky Illinois preacher named John Shefford, disillusioned with the narrow-mindedness of his congregation, appears in Arizona. At a “sealed-wife” village, where Mormons hide the practice of polygamy from the federal government, he picks up the trail of the grown-up Fay. Thus begins an exciting story of captivity, treachery, and last-minute escape. The collapse of one of the stone walls of Surprise Valley, which has imprisoned gunman Lassiter, Jane Withersteen, and young Fay Larkin for ten years, results in their capture by a hooded Mormon. 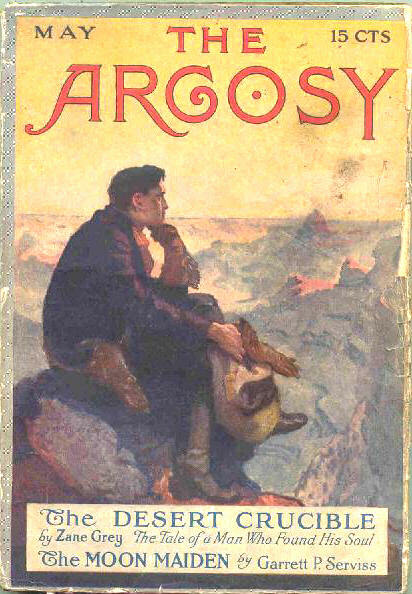 Then Lassiter and Jane are offered a deal: their lives in exchange for the immediate marriage of Fay Larkin to the mysterious, cruel, Mormon leader. This unforgettable story can at last be read just as Zane Grey wrote it, without the editorial cuts made to the original publication. Jim Shefford, Jane Withersteen, Ventner, Lassiter and Fay Larkin once again become the characters we get to meet most often. There is plenty of action and many descriptions of nature in either version. If I was going to purchase/get hold of this novel now, I would go for The Desert Crucible – the one that the publishers considered too controversial for its times. Here Lake hesitated and broke off. Not improbably he had meant to say that of all the Mormon women in the valley Ruth was the least likely to suffer from punishment inflicted upon her soul. “Reckon you’d do just as well to walk round and come up to Ruth’s from the other side—instead of going through the village,” suggested Joe. Shefford approached Ruth’s cabin in a roundabout way; nevertheless, she saw him coming before he got there and, opening the door, stood pale, composed, and quietly bade him enter. Briefly, in low and earnest voice, Shefford acquainted her with the plan. “You love her so much,” she said, wistfully, wonderingly. “Indeed I do. Is it too much to ask of you to do this thing?” he asked. She gave him another of the strange glances. “I don’t risk so much as you think,” she said, significantly. She came close to him, and her hands clasped his arms and she looked up at him, her eyes darkening and her face growing paler. “Will you swear to keep my secret?” she asked, very low. “God Almighty!” broke out Shefford, utterly overwhelmed.